But it takes two to tango the gossip dance. “Without wood a fire goes out; without gossip a quarrel dies down: (Proverbs 26:20). The Bible tells us to make every effort to avoid gossipers (Proverbs 20:19). A good rule of thumb is if you are not part of the problem or part of the solution, then keep the information to yourself. Paul warned, “Some of you are living idle lives, refusing to work and wasting time meddling in other people’s business,” (2 Thessalonians 3:11 NLT). Other translations call such people “busybodies,” (NASB, NIV). And listen, putting the words, “we need to pray for so-and-so” before the gossip doesn’t make the gossip any less gossip. One day a woman felt overwhelmed with guilt over her years of malicious gossip. She went to the local priest and confessed her sin. The priest was all too aware of her wagging tongue and had experienced the sting of her words first hand….or rather second hand. What can I do to rectify all the damage I have caused with my gossip?” she asked. “Now go back and retrieve each of the feathers,” he replied. Here’s an idea. If a friend approaches you with some “news” or a “concern” about another person, stop and ask, “May I quote you on what you’re about to tell me?” That will usually “put a lid” on the conversation before it even begins. 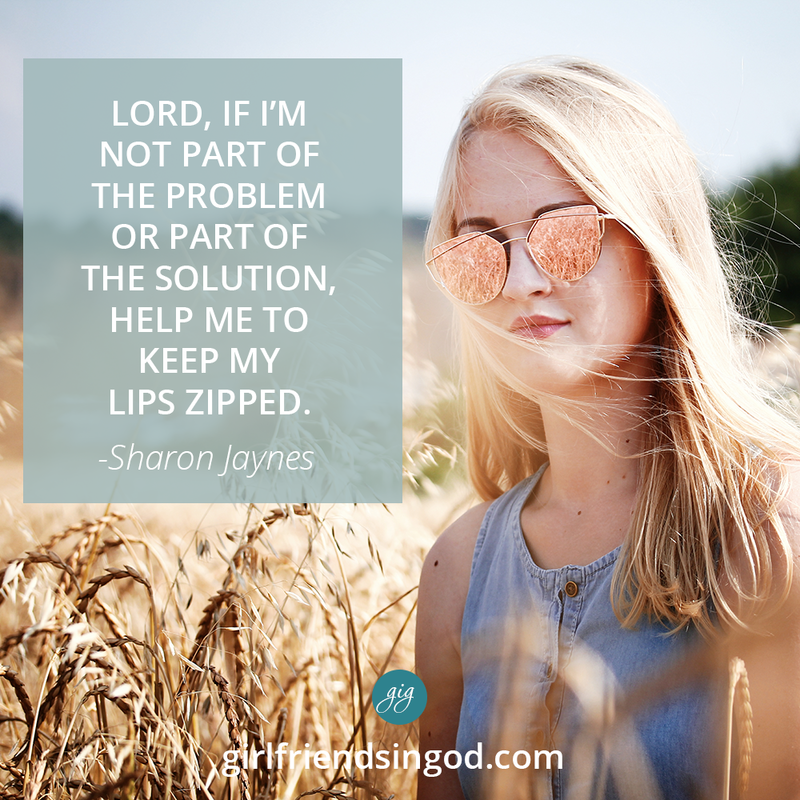 If you are willing to take the challenge, click over to my Facebook page at www.facebook.com/sharonjaynes and type in the words: “I’m still living in a NO GOSSIP ZONE. OK Lord, I’m coming to You with this request again. Please help me not to gossip. Help me not to repeat a matter that is none of my business. If I’m not part of the problem or part of the solution, help me to keep my lips zipped. May the words of my mouth be pleasing in Your sight! Since my last devotion on gossip, have you been more aware of the words coming out of your mouth? Have you begun a story, only to stop before it actually came out of your mouth? I have! Praise God! Consider writing this verse on an index card and taping it to your bathroom mirror. Today’s devotion was taken from my book, The Power of a Woman’s Words. If you would like to learn about how to control your words and use them to speak life into those around you, then this is the book for you. Visit www.sharonjaynes.com to download a free chapter or watch a video. It also has a companion Bible Study Guide and DVD. I despise gossip, and am in the midst of it right now. I will share this, and hope your words will be read by those that need it. Your devotional today is a wonderful reminder, which we call need at times. Your previous post on gossip has truly opened my eyes and has helped me to be much more mindful of the words coming out of my mouth. Thank You! I am still living in a gossip-free zone with the help of my God! I love praying for people but I do not need to know the details- thank you!! My family “cannot keep a secret” for anything. My mom, sister, daughter, niece and yes, me too, seem to share everything with each other. When we do not, it seems we have been left out of the mix and then, that too, can cause friction. I don’t think any one of us consider it gossip, but after reading your article, I believe I need to reassess. I like your guideline – if you wouldn’t say it to or in front of them, then perhaps it should not be shared at all. Concerning the GiG App; we are aware of the problem. GiG has been working on releasing a new App – it was to be released before the previous app became obsolete. We are so sorry for the delay in the new app going live. The new app is in line for approval at Apple, and we are at their mercy. Be assured the new app is on its way. As soon as Apple gives the approval, we will be live. Thank you for your understanding and grace as we wait for Apple to give us the go! Please join us in prayer that it will be soon! What’s that? a wish come true!!! Rejoice! May the Lord’s face shine on thee!